It was exciting stuff. When I saw the initial trailer, I was happy... but the highlights of that was the sight of X Wings and the Millennium Falcon in flight. However when I saw this second trailer, I was overjoyed. It was just a step-up. Yes there's that big reveal of Han Solo and Chewie at the end... but for me, that was icing on the cake. The general feel of the teaser just recaptured some of that old Star Wars magic. It was the clever use of specific John Williams scores, coupled with dialogue from Luke Skywalker that most caught my imagination. 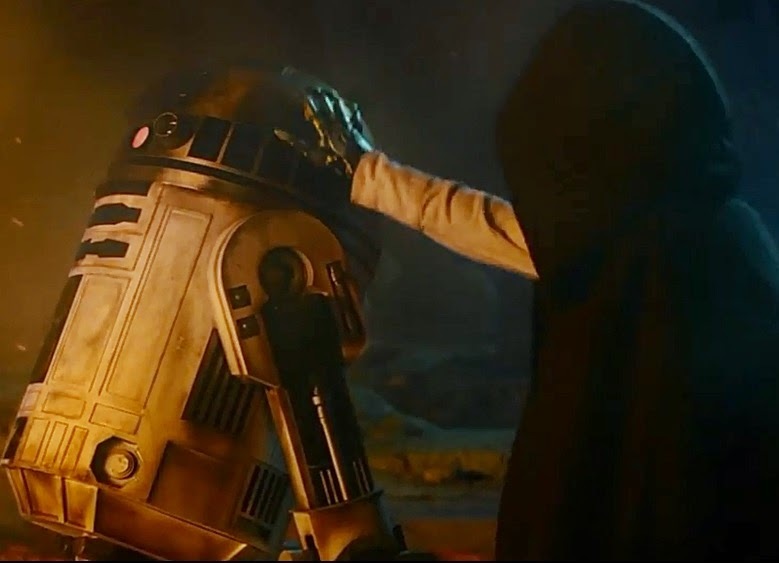 A hooded cyborg (in all likelihood, Luke), affectionately places a hand on R2D2 in the new teaser. When I look back to the flawed works that were the prequel films, I think it is pretty fair to say that for some people one of the things that annoyed long time fans, was the introduction of midichlorians as a way of explaining the nature of The Force. Star Wars works best as space fantasy and mythology... it doesn't require an overly heavy explanation as to the mechanics of its universe in quite the same way that Star Trek or Babylon 5 might. Part of the beauty of Star Wars was the idea that the Force *is* a mystery - something to be probed, contemplated and explored, but never really answered. This is probably never more evident than in The Empire Strikes Back, when Luke Skywalker begins his training under Yoda. Now it's true that Yoda's musings slant towards Eastern philosophies, but I think they are general enough that the wider world can lap it up and draw its own parallels. "I put the Force into the movie in order to try to awaken a certain kind of spirituality in young people--more a belief in God than a belief in any particular religious system. I wanted to make it so that young people would begin to ask questions about the mystery. Not having enough interest in the mysteries of life to ask the question, "Is there a God or is there not a God?" --that is for me the worst thing that can happen. I think you should have an opinion about that. Or you should be saying, "I'm looking. I'm very curious about this, and I am going to continue to look until I can find an answer, and if I can't find an answer, then I'll die trying." I think it's important to have a belief system and to have faith." Yet strangely despite Lucas' motivation, I've always found the stories where these themes were explored with the most depth and the most explicitly were in The Empire Strikes Back and Return of the Jedi. Both of these were co-written by Lawrence Kasdan. This is why I'm greatly reassured about The Force Awakens... Kasdan is back on board. Going on this fact and the feel of the trailer, I am quite hopeful that this new batch of films will be the spiritual successor of the original Star Wars trilogy. I do wonder if the new films are going to explore an evolution of Jedi beliefs. As uncomfortable as I am with the idea of midichlorians in the past, what if Qui-Gon Jinn's death and the subsequent Jedi purge, became the catalyst for a Jedi Reformation? Qui-Gon was the first Jedi to return from the netherworld of the Force; what if his spectral instruction of the exiles Yoda and Obi-Wan, led them to a deeper understanding of the Force... one that led them to realise that midichlorians were not the Force... but were just present on/in many beings who were Force sensitive? Maybe they were symbiotes or harmless parasites that hitched rides on many Jedi because they could feed off Force energy. It's a way of bringing back and reinforcing of the concept of the Force as primarily being mystical in nature as opposed to biological. I think there is a God. No question. What that God is or what we know about that God, I'm not sure. The one thing I know about life and about the human race is that we've always tried to construct some kind of context for the unknown. Even the cavemen thought they had it figured out. I would say that cavemen understood on a scale of about 1. Now we've made it up to about 5. The only thing that most people don't realise is the scale goes to 1 million. I think there's definitely a place for organised religion. I would hate to find ourselves in a completely secular world where entertainment was passing for some kind of religious experience. Do you think there is a God? Has Star Wars in any way influenced you on a spiritual level? Do you agree or disagree with George Lucas that organised religion has a place in society? What are you most looking forward to in Star Wars Episode VII: The Force Awakens?